Lavr Georgievich Kornilov was a general in the imperial Russian army and the counterrevolutionary Volunteer Army. He is most famous for attempting a military coup against the Russian provisional government while serving as its commander in chief. Lavr Kornilov was born on July 18, 1870, in Turkistan, the descendant of Russianized Tatars and Cossacks with long-established traditions of service to the Russian state. He graduated from the Nicholas Academy of the General Staff, a professional school for promising young officers of good family background. After he served in obscure posts in Russian Central Asia and on the Afghan border, the Russo-Japanese War (1904-1905) provided Kornilov an opportunity to display his military skill and personal recklessness in a more significant arena. Out of this conflict, disastrous for Russia, Kornilov emerged a field-grade officer, tested in battle and ready for broader responsibilities. 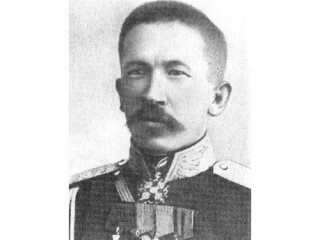 In addition to command experience, he served as Russian military attache in China from 1907 to 1911. With the outbreak of World War I, Kornilov received command of a division. His aggressiveness on the Austrian front and daring escape after capture gave him a reputation for boldness throughout the army. The Revolution of March 1917 accelerated his rise to prominence. He resigned as commander of the Petrograd Military District, taking command of the 8th Army. After the debacle of the July offensive, which disgraced much of the senior military leadership with the provisional government, Kornilov was named commander in chief of the Russian armed forces. The following month opposing viewpoints of Kornilov and the provisional government became clearer and more hardened, with Kornilov insisting on complete restoration of civil and military order at the front and throughout the country as a condition for his support. As it became clear that the provisional government would not, or could not, take independent measures to meet his demands, Kornilov planned a coup. During the last days of August and the first week of September, Kornilov concentrated troops in the Petrograd area and ordered the "Savage Division," composed of supposedly bloodthirsty Caucasian mountaineers, to advance on the capital. The abortive coup demonstrated that the Kerensky government could not control political and military affairs— possibly its most significant result. Kornilov's action showed breakdown of authority and confidence between the government and the high command, and the coup itself was thwarted not by loyalist forces but mainly by the radical workers' soviets. Alarmed by the threat of military dictatorship, the soviets called on workers to arm themselves and to block telegraph and railway communication between the oncoming troops and Petrograd, measures so effective, together with intensive propaganda among the soldiers, that Kornilov's strength virtually evaporated overnight. On September 14 Kornilov was arrested and held prisoner until early December, when he escaped to the south with other generals collaborating in forming the Volunteer Army to regain control from the Bolsheviks, who had seized power in November. Kornilov's role in the Volunteer Army, commanding and dashing as ever, was cut short by his death in early April 1918. View the full website biography of Lavr Kornilov.